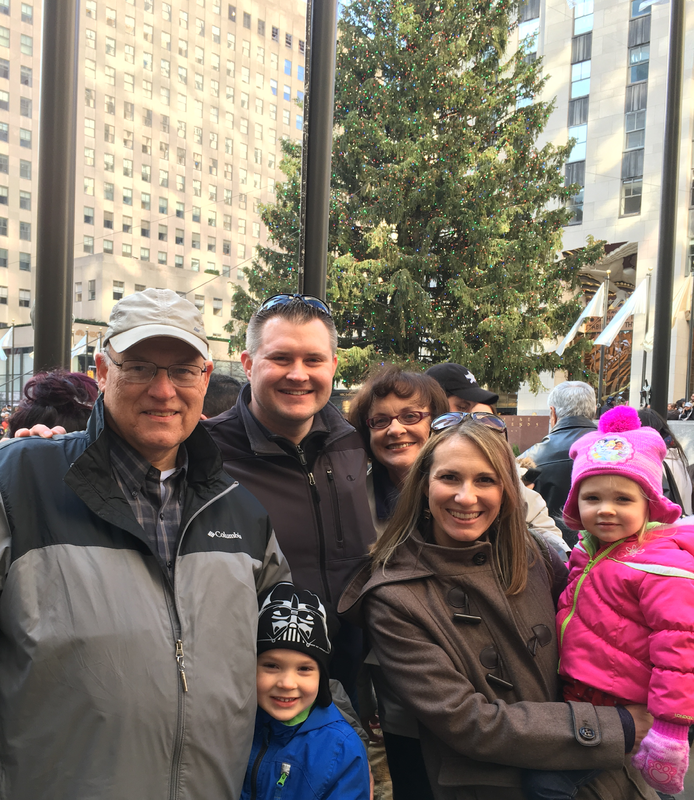 We took a fun day trip to New York City a few weeks ago to show the kids all the sights and sounds of the Christmas season. Since we live outside of Philadelphia it only takes about 2 hours to drive to NYC. Great for a day trip. So, we packed some supplies (and you know that means TONS of food allergy friendly food!) and off we went! This is a photo of all of the food allergy friendly food I packed. I knew it was too much, but I felt better having too much than too little. This was supposed to cover the kids' second breakfast (yes, we have lots of second breakfasts in this house! ), multiple snacks in the car, and a possible lunch if we didn't feel it was safe for Little Guy to eat at a restaurant. We parked at a lot near Rockefeller Center (thanks to the Hubs for driving! ), and we walked about a block to see the tree and ice skating rink. It was PACKED with people, but everyone was in good spirits. We surprised the kiddos by meeting my parents there (Yes, this includes the famous Grandma who wrote "Grandma's Guide to Holiday Hosting with Food Allergies"). Being together was a great treat for everyone! Little Guy is VERY into Legos right now as a 5 year old, so despite the long line, we stopped at the Lego store right in Rockefeller Center and bought the kiddos two Lego sets. I did research beforehand on AllergyEats to find safe restaurants around Rockefeller Center. I also searched on a few of my favorite allergy related Facebook groups, and I did a general Google search. 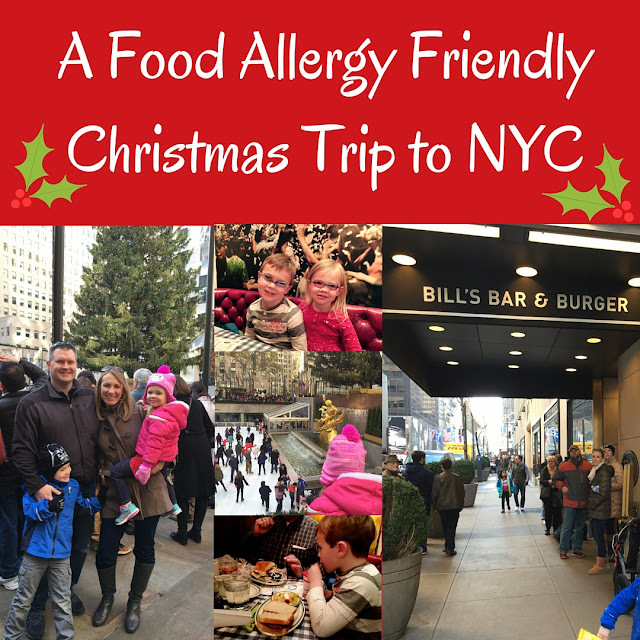 I called a few different restaurants a few days before and I decided that Bill's Bar & Burger and Del Frisco's Grille would be the best choices in the Rockefeller Center area for Little Guy's food allergies. It's a large (2 floors), festive restaurant and noisy kids are not an issue! The food is very kid-friendly - burgers, sandwiches and salads type meals. Pretty similar to Red Robin or a diner. SANTA CLAUSE was there! He was walking around the restaurant talking to all the kids. Their eyes just lit up when they saw him. 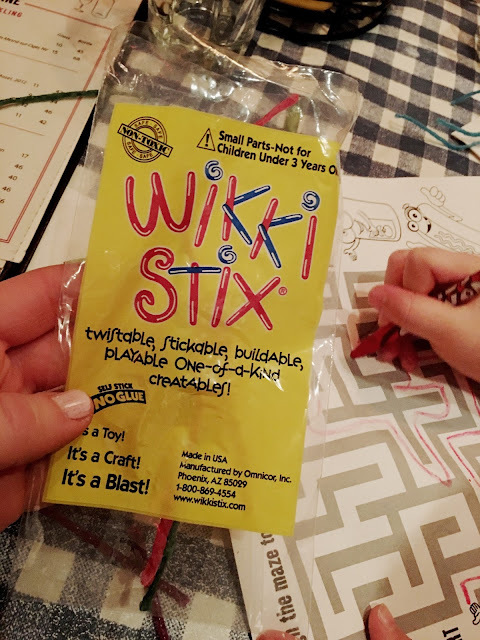 Every kid gets WikiStix to play with while waiting. How genius is that!? They also give kids crayons and a coloring page to pass the time. I'm always nervous when we go to a new restaurant due to Little Guy's food allergies. It was even more nerve-wracking that day since it was REALLY busy and loud in the restaurant. The waitress took awhile to get there, so I actually got up to find a manager first thing to discuss whether they could make safe food for Little Guy. I gave him our chef card and he assured me they could make a plain hamburger with veggie or fruit. He said to make sure the plate has an allergy stick in it to confirm that it's the allergy-friendly meal. I was relieved when they brought out a plain burger and side of fruit with the allergy stick in it. Then I gave Little Guy his safe bread to make a sandwich. I was relieved even further when he ate it with no problems! Phew. It was a perfect day trip to NYC for a 5 and 3 year old. And the most important part? We came together as a family to enjoy the anticipation of Christmas and get in the spirit! Have you ever been to NYC at Christmas time? OR if you have food allergies, do you have any other restaurant recommendations? Merry Christmas and Happy Holidays from Mamacado! !